No picnic without some jus d'orange, grapes and of course our all time favourite: a baguette with spreads. Al those snacks need to be wrapped up nicely! 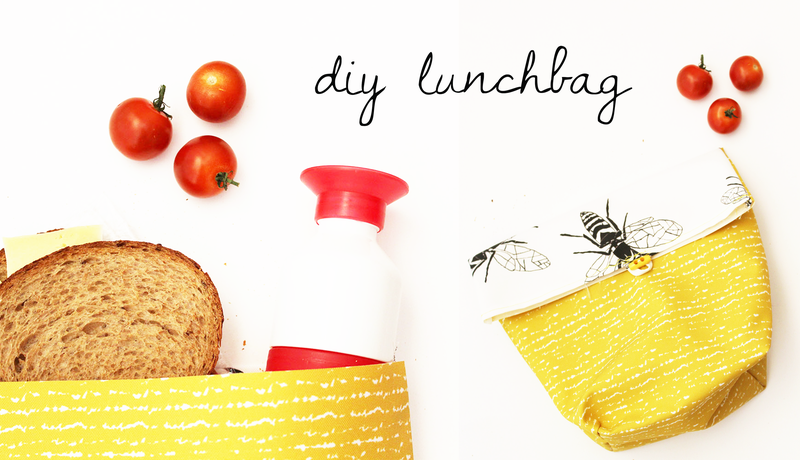 In this blog we will show you how to make your own, unique lunch bag. Totally in style of your picnic, matching with your selfmade picnic blanket or tent. And of course, you can also take your lunch bag to school or work! Click here for the wasp-pattern! Click here for the golden glow pattern! When you choose two different kind of fabrics, you will get a playful effect! At Motiflow you can easily order 50 by 100 centimeter fabrics, and you can choose between hundreds of prints. For this picnic lunch, we immediately thought of the wasp-pattern by Noordzeestudio, a funny detail. But you can also choose a sushi-, egg-, or fruit pattern. And how about a cake-print for a sweet tooth? No doubt everybody will ask you where you got your lunch bag! for this DIY we made a video. So you can watch and learn! Don't forget to subsribe to our Youtube channel. Here we will upload more DIY video's. We will also explain the steps shortly below. Mark the fabrics with a pencil at the right dimensions as lsited above. Don't forget you also need to cut the loop for the button closing. We start right away with the hardest part of this DIY, the making of the loop for your button closing. This is a fiddly job. Fold the fabric in the length, and then fold it back open. Now you have a beautiful foldline right in the middle, so you can fold both sides to this foldline. After that you fold it double again. Now you have along, firm strip of fabric. Pin it and then sew up the loop. Fold the fabric your loop needs to go on (in our case the wasp-fabric) 1 centimer and then pin it. In the middle of this folded edge, you also pin the loop. Sew up the folded edge as well as the loop. Put the biggest pieces of fabric on each other and pin the edges. Now cut a square at the bottom left and right corner. The squares need to have a 5 centimeter height and 6 centimeter width. You do this so you can make a flat bottom for your lunch bag. It also gives the lunch bag a nice shape and you can put way more it it! Next up, you sew up the sides. Make sure you skip the (cutted) corners. Time for a good bottom! 😉 Fold the corners of the cutted squares to each other, so you get a flat bottom. Pin it and than sew up the first side. Also do this for the other side. You're almost there! Turn the fabric inside out again and then push the corners so your lunch bag will get in shape. Fold the flap and then lay your button on the fabric to find the right spot. Sew up the button and then you can close your lunch bag by putting the loop around the button. Voilá, a super original, self made lunch bag! In case you don't want to use a button, you can also use Velcro. Extra handy for kids. Or choose a longer flap so you can roll it up. What lovely lunch will you bring with you in your self made lunch bag? This month you can win two meter of Poly Outdoor fabric with the #motiflowfavourite give-away! The same fabric we used for this DIY. Wanna join? Read more about it here. Are you going to make this DIY? Then don't forget to share it with#diymotiflow, so we can like, share and enjoy your creations.